yoga art by sweetmango. sweetmango was surrounded by the fires in Australia. buy her art! 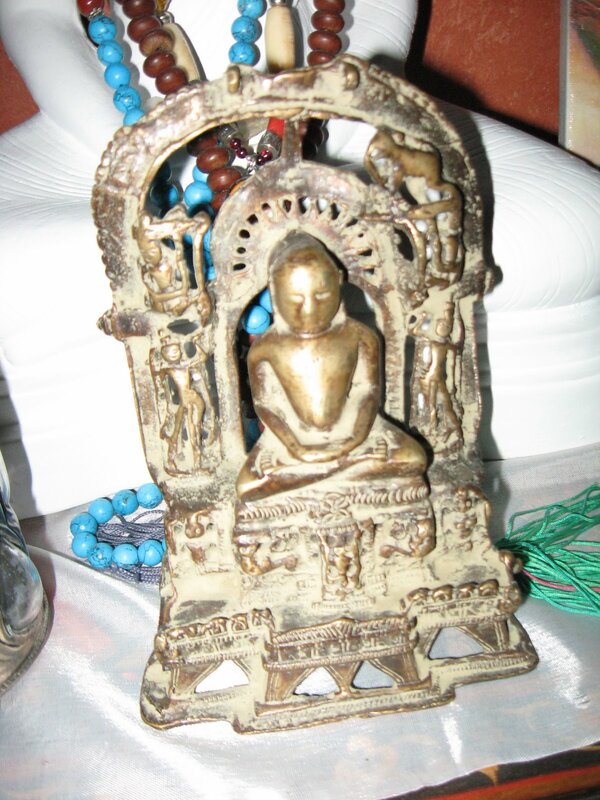 close-up of antique Buddha — it’s heavy! 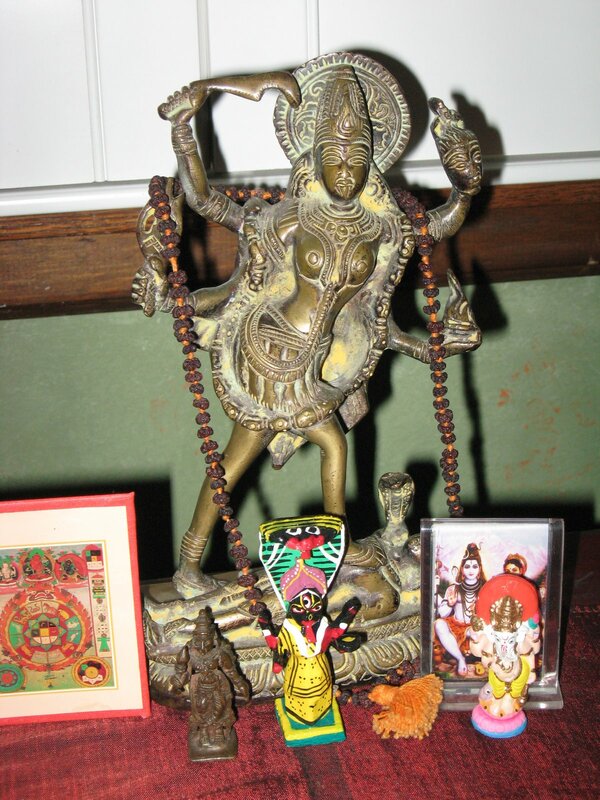 Hindu altar with bronze statue of Kali standing on Shiva, bought in Chennai, India. It is rare to find a statue of Kali in Tamil Nadu. Front row left to right: bronze statue of Parvati, bought in Pondicherry antique store; wooden statue of Kali bought in Varanasi, sent to me by a friend; picture of Shiva and Parvati; clay statue of Ganesha; mala on Kali bronze is over 30 years old, given to me by a dear friend. and my heart be linked to the Truth that lies deep within me. 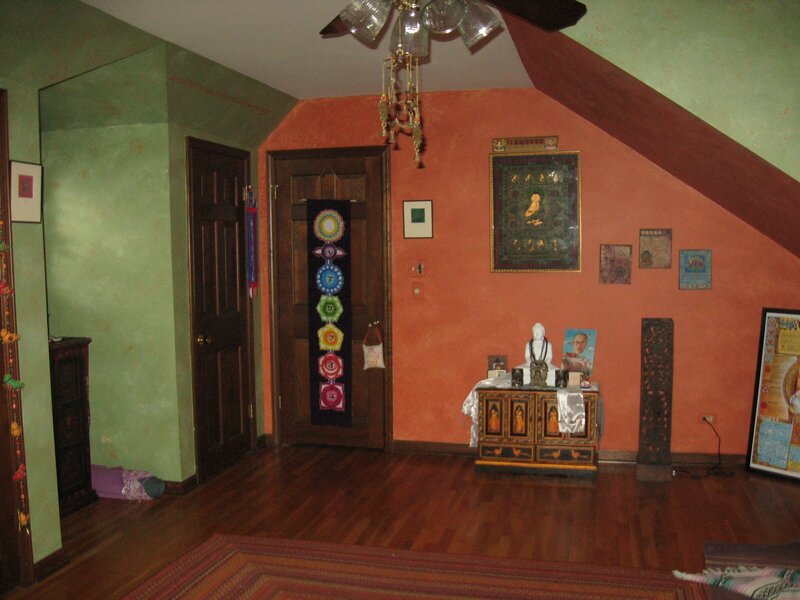 When we came to look at the house I saw this room and said “this is my yoga room.” I also immediately “saw” those colors — I wanted a deep orange (since I’m a second chakra gal) and grass green. 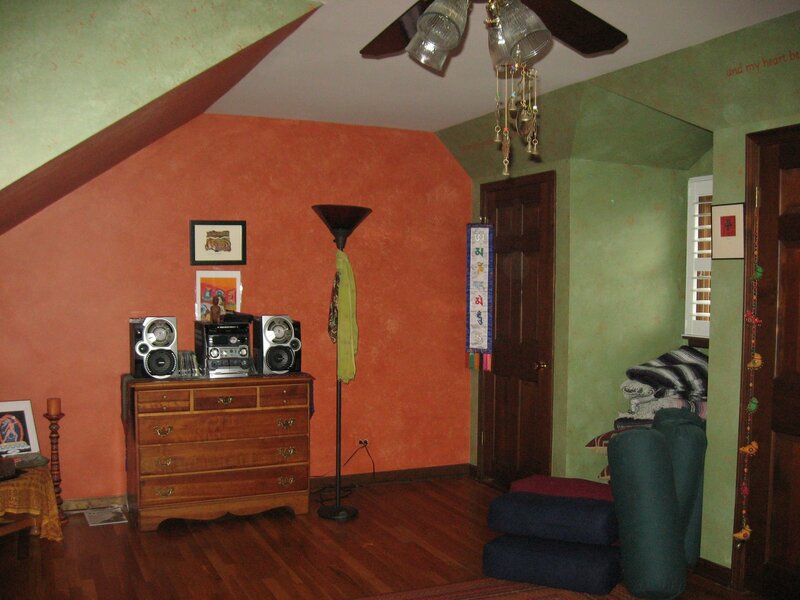 You can’t see it very well, but on some of the walls there’s a “plastic bag technique” with the paint. The only down side to the room is how the roof slants — I can only fit so many people for a vinyasa class, not good for raising the arms overhead! But I love the space, it has good energy, all the time. 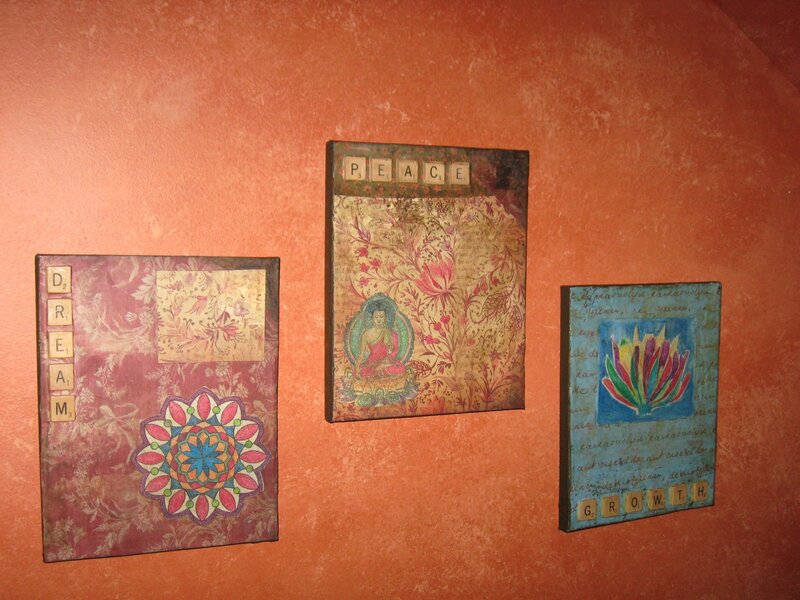 Your yoga room is beautiful!! Makes me wanna come over and do yoga 🙂Lovely art, too. Can’t see a link on her website to look at/buy art though? What a great place for a class…I hope you had a good one tonite with the fb gang! Someday, some room will be dedicated…for now it’s the 18″x 72″ space I unroll the mat. Move over, cats! 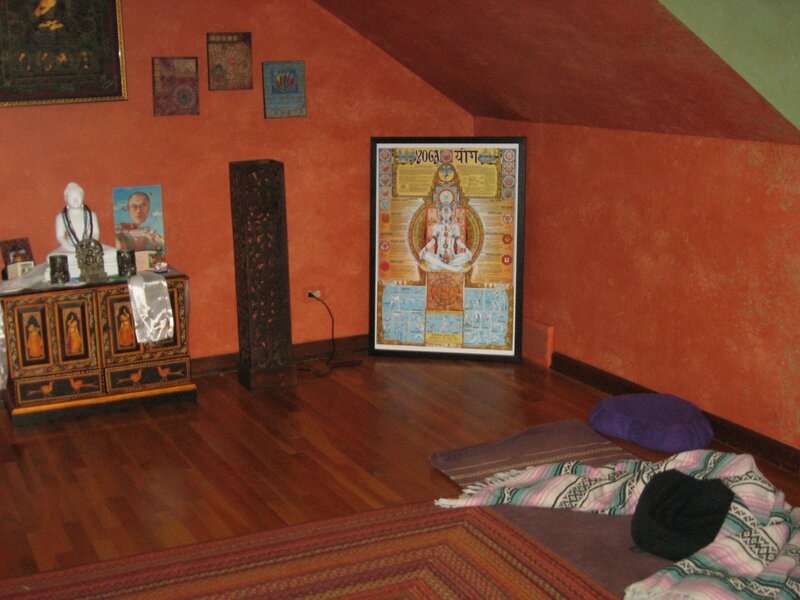 Hey Linda, We LOVE your yoga room. Gary (Mr AnthroYogini) and I want one in our house! Linda,What a beautiful space. You have an incredible visual sense that comes through on the blog and now I see and enjoy it in your environment. The “vibe” comes through the pictures! 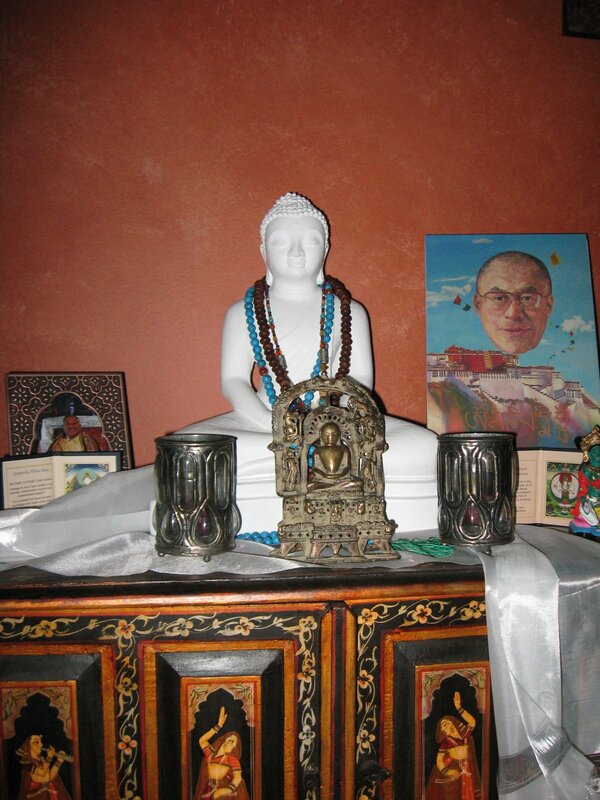 …so nurturing and inspiring…it feels as if I am there practicing with you. I love the quotation you painted on the wall, too.Thanks. Very nice. Gives me lots of ideas for my future yoga room. Your room is really wonderful. I love the art and the colors are bold. Beautiful and inspiring. Thank you for sharing!